Recently, a major milestone in space exploration was reached: a planet was captured in a picture! That may not sound like a big deal; after all we've been enjoying beautiful, highly detailed color photography of planets—Mars, Jupiter, Saturn, and the rest—for a long time. The big deal is that the planet captured in this shot, a gas giant planet named Beta Pictoris b, is 63 light years away--over 100,000 times farther away than even Pluto. The bigger deal, maybe, is that the instrument that captured Beta Pictoris b, the new Gemini Planet Imager (GPI), did so without working up a sweat. Not only was it the first picture that GPI ever took, as a practice shot, it snapped it in only a minute—a feat that would have taken previous instruments over an hour to accomplish. GPI took this maiden-voyage picture (coined "first light" in the world of observational astronomy, when a new instrument is first exposed to photons from an object in space) last November. 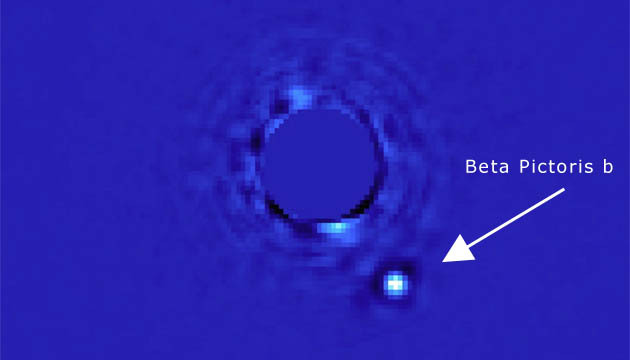 And though the planet Beta Pictoris b appears as a dot only a few pixels across, this is the best direct image of an exoplanet to date—and GPI's capabilities go well beyond the production of images. GPI is designed to reveal characteristics of its target planets like mass, composition, and even the material environment surrounding it. It is capable of detecting planets around Jupiter's size orbiting their stars at distances between 5 and 40 Astronomical Units—a range that in our solar system spans the orbits of Jupiter to beyond Neptune. And of the over 1000 exoplanets currently known to exist, most of these are gas giants—exactly the type of planet GPI is designed to observe. GPI is a currently operating at the Gemini South Observatory in Chile. It uses the technology of adaptive optics to remove the distortions created by Earth's turbulent atmosphere, the age-old impediment to conventional ground-based telescopic observation. The heart of an adaptive optics system is a deformable, computer controlled mirror that adapts the shape of its surface to match waves of atmospheric turbulence, thus canceling them out—somewhat analogous to how noise-canceling headphones use samples of audio noise to cancel them out of what we are listening to. GPI also employs a "coronographic" mask to block off the intense brightness of a star in favor of seeing a planet as much as 10 million times fainter—just as you would use the sunshade in your car to block the sun's disk in order to see the road and driving obstacles without being blinded. The adaptive optics allow astronomers to make observations with the clarity of a space-based telescope, like the Hubble, but with the comparatively much larger telescopes that can be built on the ground. In comparison, the Hubble's primary mirror used to collect and focus light is only 2.4 meters in diameter, while the telescope the GPI instrument is currently using has a mirror 8 meters across and with over 10 times the light-collecting surface area. We've come a long way in our ability to perceive planets orbiting other stars. From the first exoplanet detection in the early 1990s and for years after we could only infer the existence of other worlds in the universe indirectly, by a couple of techniques. In one method, as a planet orbits its star its gravity causes the star to wobble off center ever so slightly—but enough for us to measure minute shifts in the wavelengths of light emitted by the star. Using a spectroscope, which measures the different wavelengths of light in the star's spectrum, we can detect the variation in the star's motion toward and away from us as it wobbles. This is made possible by the Doppler Effect, the same phenomenon that the highway patrol uses to measure the speed of cars with a radar gun. Another technique, the "transit" method, takes advantage of the fact that when a planet passes in front of its star it blocks out a small portion of the star's light, which we can measure as a slight dimming of the star's brightness. Though only a small fraction of extrasolar planetary systems can be detected by the transit method—those whose orbital planes are aligned with our line of sight to the star—a survey of the stars observed for transits by NASA's Kepler spacecraft suggest that planetary systems are quite common in our galaxy. We won't be seeing pictures of exoplanets that show details like cloud patterns, atmospheric storms, and polar vortexes anytime soon, but the richness of details that we can know about these distant worlds is improving all the time—and has taken a long stride forward with GPI. As we assess and refine our understanding of planets' mass, atmospheric composition, temperature and other characteristics, our imaginative visions of alien worlds can only become better informed.